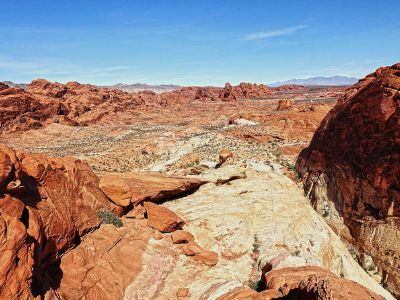 These Valley of Fire tours from Las Vegas take you to one of the most fascinating places on the planet! The landscape of the valley is something you will be talking to your friends about for a long time. You will be amazed by the colors of the sandstone formations and by how the valley reminds of a museum of statues under the open sky!These rock formations, shaped by wind and rain, remind of animals, bizarre castles and bridges. Not to mention the ancient petroglyphs left by Indian people who used to inhabit this region. What's even better: some of these activities are not just sightseeing tours: you can hike, ride an ATV or a Mini Buggy at Valley of Fire! 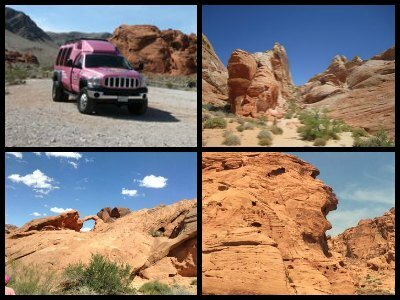 Valley of Fire tours from Las Vegas by Pink Jeeps are fun and very comfortable. Their luxury vehicles, that are actually closer to SUV than to Jeeps, are fully equipped with everything you may need from huge windows to reclining seats, air conditioner and snacks. So you can just relax and enjoy your ride until you get to Valley of Fire. There, the Pink Jeep's highly knowledgeable tour guides will show you the very best parts of the valley, including the famous ancient petroglyphs, the Elephant Rock, and the Fire Canyon. You will need to decide what type of hike you wish to have while at Valley of Fire. 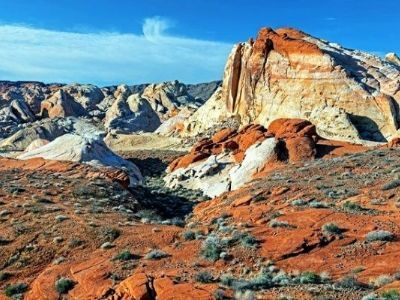 There are three choices of guided Valley of Fire tours from Las Vegas that range from novice to expert. There are also three time slots per day sunrise, afternoon and sunset with the flexibility for an adventure of four to seven hours. You will be shuttled from your hotel until you reach the visitor’s center at Valley of Fire. From the visitor center you will hike through amazing natural rock carvings as well as petroglyphs that are 3,000 years old. Your guided hike will include valuable history and landscape commentary as you let your mind absorb the majestic scenery. On the way home you are shuttled back to your hotel. There are some age restrictions. Please wear the appropriate clothing and hiking or athletic shoes. Snacks and beverages are included. Unlike ATV tours, riding a mini buggy is suitable for children over 3 years old! 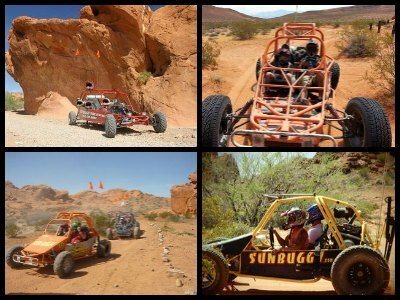 A buggy is a small off-road vehicle designed specifically for the rugged trails of Valley of Fire. With these adrenaline-filled Valley of Fire tours from Las Vegas by Mini Baja buggy You will ride through the terrain where many episodes of Star Trek were shot! It's really easy to operate a mini buggy - inside it's just like a regular car - with brakes, and pedals and all, and even 16 year olds can ride it safely. The buggies come as double-seater, four-seater and six seater so you can share the fun with your whole party! During these informative Valley of Fire tours from Las Vegas you will not only be able to see and take pictures of the most gorgeous landscapes, but you will also visit the Lost City Museum that boasts the largest collection of artifacts left by the Pueblo Indians. The museum has been collecting relics since 1935. The highlight of the museum is the reconstructed Anasazi buildings (on the picture) that everyone if free to explore. When you want to experience adventure outside of Sin City then a perfect way to see the incredible landscape is to travel through area on the Valley of Fire Tour from Las Vegas by ATV. Your 7-hour journey begins with complimentary hotel pick-up service where you will be taken to start your thrilling Valley of Fire day trip. Once you learn the basics of how to operate your ATV you will take-off with your expert guide leading the way. You will be delighted with interesting rock formations and the wildlife you will see while driving your ATV on trails that range from easy to difficult. You will get a chance to rest during your explorations of this remarkable area with a free picnic lunch which includes beverages. You will learn plenty about the environment on this adventure and your excursion concludes with complimentary drop-off service at your hotel. This is a very interesting helicopter tour that includes both the Grand Canyon West Rim and Valley of Fire, as well as a scenic flight over Las Vegas Strip on the way back. So if you don't want to walk around Valley of Fire, and want to take a helicopter flight, this tour might be for you! These Valley of Fire tours from Las Vegas include a free picnic with champagne at the bottom of the Grand Canyon, right next to the Colorado River that created this wonder. On the way back, your helicopter will fly slowly over Valley of Fire and the Strip while you are taking in the views! 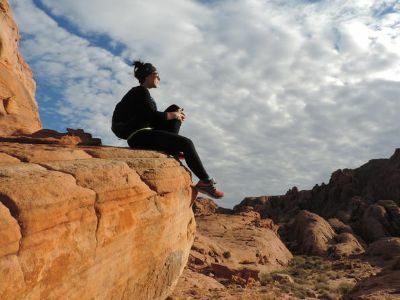 An intimate hiking excursion through one of the most spectacular landscapes in the world is the Private Valley of Fire Hiking and Sightseeing Adventure Tour. This Valley of Fire tour is perfect for all skill levels and you can help a veteran out too. 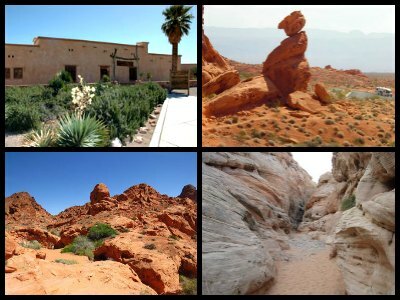 There are two options which are a 6-hour half-day or a 10-hour full-day hiking adventure that begins with Adam, a former U.S. Army Infantry Soldier and now tour company owner, picking you up at your hotel and transporting you in a comfortable SUV to the Valley of Fire State Park. Along the way Adam will explain all the interesting sightseeing opportunities you will experience as well as get a feel for your hiking ability and adventurous spirit. Once at the state park, Adam will take you on a truly once-in-a-lifetime hiking journey through a landscape that was created 150-million years ago. He is the perfect guide for this adventure with years of experience in the outdoors and knows how to take care of hiking partners through his training as a member of the U.S. Army. As you hike through the brightly colored sandstone rock formations and ancient sand dunes you will stop for photographs and there are plenty of healthy snacks as well as water provided to replenish your body while hiking. Your day concludes with drop-off service back at your hotel. 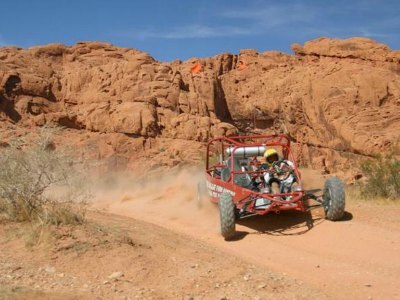 You can feel the wind in your hair and the excitement of driving a powerful 3-wheel vehicle when you take the Slingshot 3-Wheel Sports Car Valley of Fire Tour. 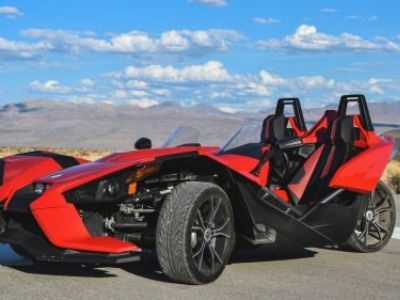 Your 5-hour driving extravaganza begins when you arrive at the Slingshot Experience and get oriented with this unique 180-horsepower 3-wheel vehicle. After a quick driving lesson you will set-out on the road with the wind blowing through your hair while you view the iconic Mojave Desert as you drive towards the Valley of Fore State Park. Once at the state park, your GPS system will guide you through the incredible landscape of brightly colored rock formations that range from red to orange to purple to pink. As you travel through the state park you can stop at several locations for photographs or to climb the interesting formations to gain a better view of this special place which is the oldest state park in Nevada. There is plenty of time on this adventure to stop at the visitor’s center too where you can learn all about this surreal landscape that was created 150-million years ago. After you let the throttle go one last time down the highway, your excursion concludes back at Slingshot Experience. A great way to unwind and relax as well as enjoy some spectacular scenery is to try the Private Helicopter Flight and Yoga Session at Valley of Fire Tour. Your 2.5-hour journey starts with free pick-up service from your hotel where you will be transported to board a six seat customized sightseeing helicopter that is equipped with wireless headsets for narration of the sights. After takeoff you will soar over the Mojave Desert with glimpses of Lake Mead National Recreation Area in the background on your way to Valley of Fire State Park. After experiencing a flyover of the state park that is packed with beautifully colored sandstone formations, ancient sand dunes and interesting wildlife you will land on plateau overlooking the scenery. Here you will begin your yoga session in a surreal setting that is sure to motivate, relax and help your body recover from your exploits in Sin City. Your body will be pleased as you once again takeoff into the sky to enjoy a bird’s eye view of the Strip before landing where your excursion concludes with drop-off service back to your hotel. 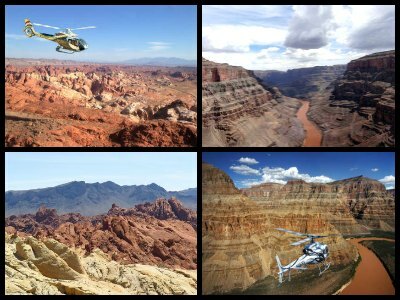 One of the more thrilling Valley of Fire tours for someone that wants a little adrenaline rush combined with breathtaking views of the Seventh Natural Wonder of the World is the Grand Canyon and Valley of Fire VIP Deluxe Helicopter Tour. Your 3.5-hour flying adventure begins with complimentary limousine pick-up service at your hotel where you will be transported to board a state-of-the-art sightseeing EC130 helicopter complete with onboard narrative of all the sights you will see. As you soar to Grand Canyon National Park you fly over the Mojave Desert, Hoover Dam, the Black Canyon and Lake Mead National Recreational Area. You will follow the Colorado River as you enter the Grand Canyon for spectacular bird’s eye views of this natural wonder. You will you land on the West Rim where you will have time to explore on foot as well as indulge in a picnic lunch with a champagne toast. From here your flight continues over the Valley of Fire State Park where you witness brilliantly colored sandstone formations that have been carved over time as well as petrified sand dunes that are some 150-million years old. Continuing onward you see the skyline of Las Vegas with flyovers of the Stratosphere, Bellagio Fountains, the Luxor Pyramids and the Eiffel Tower. Your Valley of Fire tour from Las Vegas concludes when you land and are transported by limousine to your hotel.